Raumfahrt - Space tourism will surely be a blast, but can it also improve life on Earth? Astronomie - Why is massive star formation quenched in galaxy centers? Mars-Chroniken - Können wir bald Gemüse auf dem Mars anbauen? Mountain View, CA. The Mars Institute, the SETI Institute, and FYBR Solutions Inc. (FYBR) are announcing a new partnership with the NASA Haughton-Mars Project (HMP) for the research and development of unmanned aerial vehicle (UAV) or drone technologies and applications for future Mars exploration. 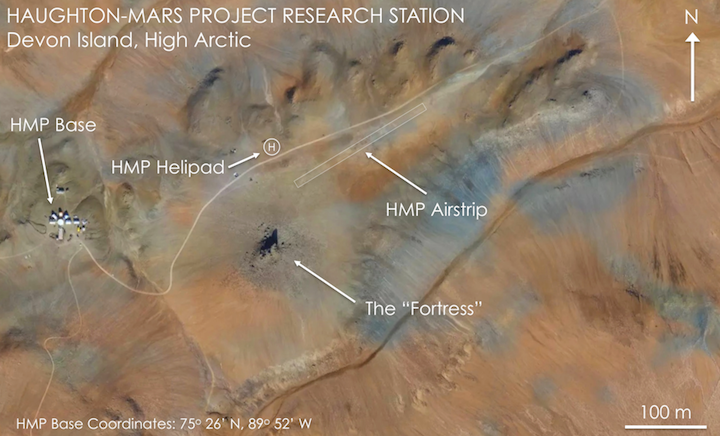 The NASA HMP is a leading international Mars analog field research project centered on the Haughton meteorite impact crater site and surrounding terrain on Devon Island, High Arctic. As one of the most Mars-like places on Earth, the site is often referred to as Mars On Earth. Over its twenty years of history, the NASA HMP has made many contributions to the advancement of Mars science and exploration through field studies at the site, including studies of the use of UAVs. FYBR Solutions Inc., formerly Spire Aerobotics Inc., is an industry leading end-to-end provider of high-resolution geospatial data and advanced data analytics. The Vancouver-based company specializes in forestry applications, but also has unique experience in the operation of drones in extreme environments on Earth, specifically in polar regions, including on Devon Island. “We’re proud to join the HMP’s team of industry partners, and excited to help make continued advances in drone technologies and remote sensing, not just on our planet, but on Mars and beyond,” says Patrick Crawford, Co-Founder and CEO of FYBR. Although Mars has a thin atmosphere, with an average surface pressure of 10 millibars, equivalent to that found in the Earth’s stratosphere at an altitude of approximately 100,000 feet (30 km), flight is possible, including with rotorcraft. NASA’s Jet Propulsion Laboratory is currently considering a robotic helicopter scout system for NASA’s upcoming Mars 2020 mission, and NASA’s Langley Research Center is developing a Mars Electric Reusable Flyer. UAVs on Mars may be used as robotic explorers, just like robotic rovers are today, but over much greater ranges and with fewer terrain obstacles to tackle. In relation to human and other robotic exploration, drones may serve as scouts, context imagers, aerial mappers, remote-sensors, search & rescue and go-fetch assistants, cave and lava tube explorers, crater and canyon wall surveyors, habitat and vehicle inspectors, aseptic samplers, sample cachers and retrievers, and more. Figure 1: UAV geospatial map of the Haughton-Mars Project Research Station site on Devon Island, High Arctic. To access the interactive map, visit: www.mars.fybrsolutions.com (HMP). The new partnership with FYBR on the HMP will focus on the development of operational strategies and flight system requirements for route planning, mapping, and the exploration of hard-to-access locations on Mars, building on already three initial field seasons of productive joint work on Devon Island. In connection with this partnership, the HMP is releasing a one-minute video titled Mars On Earth, produced by the Mars Institute in cooperation with the SETI Institute, FYBR, and NASA. Filmed entirely on location at and around the HMP Research Station on Devon Island, Nunavut, Canada, the video offers a glimpse of how Mars-like the HMP site is and the unique perspective offered by UAVs of the terrain and exploration activities at the site. Figure 2: 3D model of the Haughton-Mars Project Research Station, Devon Island, High Arctic, based on UAV geospatial data. To access the interactive 3D model, visit: www.mars.fybrsolutions.com (HMP). Additionally, the HMP is releasing interactive maps and models produced by FYBR to support science, exploration, and logistics activities at and around the HMP Research Station site. The geospatial products encompass five square kilometers at an average resolution of 5 centimeters per pixel. Features identified include the HMP Research Station’s airstrip, helipad, base structures, greenhouse, fleet of vehicles, and “the Fortress” – a local geological landmark. Future HMP research using FYBR drones and software technologies are currently planned for the HMP-2018 field season and beyond. The Mars Institute is a non-profit research organization dedicated to the advancement of Mars science, exploration, and the public understanding of Mars. Research at the Mars Institute focuses Mars and other planetary destinations that may serve as stepping stones to Mars, in particular Mars’ moons, our Moon, and near-Earth objects. The Mars Institute investigates the technologies and strategies that will enable and optimize the future human exploration of Mars. 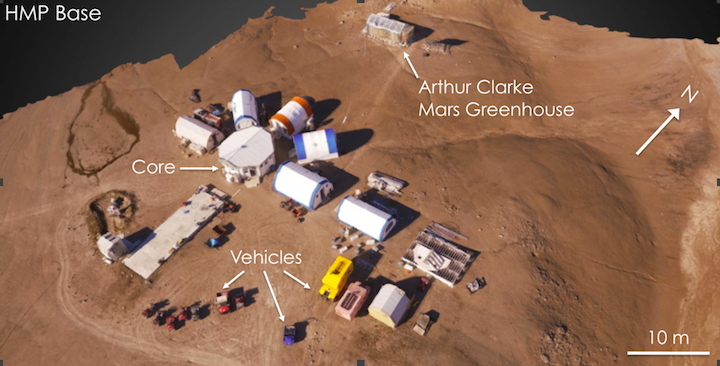 The Mars Institute operates the Haughton-Mars Project Research Station on Devon Island, High Arctic, currently the largest privately operated polar research station in the world and the leading field research facility dedicated to planetary science and exploration. FYBR Solutions Inc., formerly Spire Aerobotics Inc., is a world leading end-to-end provider of high resolution geospatial data and advanced data analytics. The Vancouver-based company’s primary focus is on supporting and optimizing the forestry industry. FYBR builds intuitive and dynamic solutions powered by drones and ground-based sensors to enable forestry stakeholders to optimize forests and the forest products supply chain. Beyond forestry, FYBR is an industry leader in drone technology, drone operations and safety, supply chain optimization, and advanced geospatial analytics.